Travelling across Europe on the second story of a Duplex train is one of the highlights of a cross-country train trip. What is a TGV Duplex? TGV Duplex are a fleet of high-speed trains, operated by the French national rail company SNCF. These are double-decker trains, which have more capacity than conventional TGVs and offers great views from the top deck. Read our guide to the TGV for more information and pictures. Duplex trains are available on a number of routes wholly within France and some International routes too. Within France, TGV Duplex normally operate from Paris and Lille to destinations in the south and southeast of France e.g. Aix en Provence, Nice and Marseille, among others. The new direct link between Paris and Barcelona operates a third generation double-decker EuroDuplex. There are also TGV-Lyria Duplex sometimes in operation on the Paris-Geneva route. We haven’t got an exhaustive list of routes which operate Duplex trains yet, but whenever the option is available we’ll give the choice when you reach the choose passenger page. When choosing trains you can see the train type above the timetable in your search results. "Duplex" trains are always double-deckers. We also list the train type and number next to each step of your journey. If you choose a TGV Duplex, in most cases you will be given an opportunity to set your seating preference on the Ticket details page. Although we can't guarantee where your seats are allocated, we'll do our best to secure seats according to your preference. You can review the seats that have been allocated on the Basket page prior to checkout. We always display all seating preferences that are made available to us, but these is at the discretion of the rail operator. Three are two notable examples when we are not able to offer a choice of upper or lower deck by default. Journeys starting in London that include a TGV Duplex train - it may not possible to specify your preference depending on the ticket type. For example, through-fares from Eurostar, that combine the Eurostar with an onward TGV, do not permit you to specify a preference for upper/lower deck. You can split your search in Paris in order that the preference for upper/lower deck is displayed for the leg wholly within France, see: Modifying searches by adding a via. Or add multiple tickets to your basket and select the preferred seats as described below. It is not possible to specify upper or lower deck on double-decker trains between France - Spain (Renfe-SNCF), including between Paris and Barcelona. We recommend checking the seats you've been assigned before checkout (61 and above are upper deck). One notable exception is the Paris-Barcelona TGV EuroDuplex, which does not currently permit seat selection. Unfortunately, this has not been made available by the rail operator. 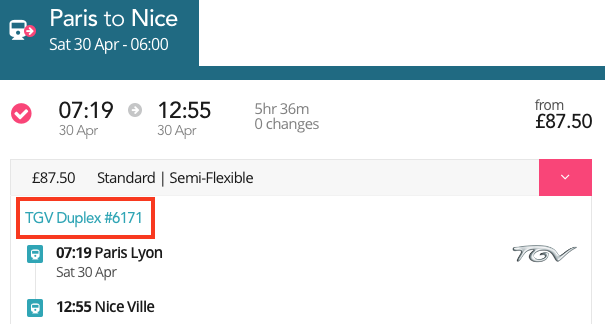 See the related article Seating preferences on the Paris-Barcelona TGV for more information.